Earlier this year, we received a letter from one of American Life League’s supporters. She wrote concerning the untimely death of her 81-year-old husband and the tragic circumstances surrounding it. This is one of the saddest letters I’ve ever received, and we’ve reprinted it below because it illustrates a current, very serious problem in our health care system. Names and places have been removed for privacy. My husband had a stroke and heart attack 12 years ago. He had treatment and went to work at a golf course. Years went by. In October 2012, his doctor thought he should have hospice. I don’t know why. The doctor hadn’t seen my husband in about seven and a half months. I was promised my husband would have no drugs, as he had no pain. He hadn’t even had an 81-illigram aspirin in the many years I took care of him. They (the hospice nurse) promised “no drugs” if I put him in respite care to give me a break. Like a fool, I believed them. I let them take him to a local hospice. In about 37 hours, he was tortured, drugged, and given a shot of Robinul at 4:10 on November 22. At 4:30, the nurse came back in and asked, “Is he gone now?” Yes—he was dead! After the shot, fluid and chunks of I don’t know what came out of his mouth so fast my daughter could hardly control it. She had to catch it in the sheet and coverlet. They advertise love, comfort, and compassion—LIES! For no reason, they tried a catheter on him. They had no permission for anything they did. He must have screamed! When he arrived [at the hospice] on November 20, he visited and joked with our pastor and his wife. I fed him Fruit Loops [cereal]. He was used to having six bacon [strips], two eggs, cereal, a donut, fruit, and tea. I cried when I went on November 21. His eyes were cracked and rolling around; he could not talk, move, or [do] anything. A ZOMBIE! If I had read this letter five years ago, I would have been tempted to dismiss it. I would have rationalized that the woman who lost her husband was in a very emotional state, and probably not remembering all of the conversations that occurred or permissions she gave. Certainly, I would have thought, medical professionals would not have acted as callously toward life as she described. But not anymore. Our family has been through so much with the medical community, regarding its treatment of my mother-in-law and aunt, that I don’t doubt this woman’s story for a second. My mother-in-law, Anne Bizub, was born on November 12, 1913. For the past 10 years, she had been living in a wonderful care facility in New Jersey. 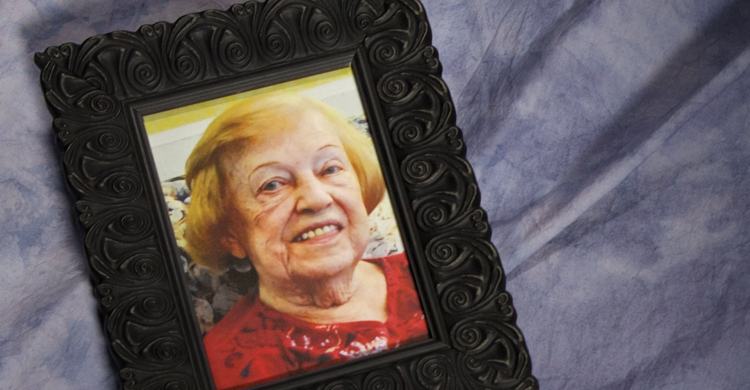 Over the years, she moved from the assisted living wing to the Alzheimer’s wing, and then to the skilled nursing wing. Through it all, she was a happy woman who had kind words for all who cared for her, and she was loved by the staff. The family was outraged and said, “You have to treat her!” The doctor declined and the family went to the hospital administration to get a new doctor assigned. That doctor treated her aggressively, and within two weeks, she was back at the nursing facility, once again enjoying life. Mom got along well, and was excited when the whole family got together and celebrated her 100th birthday in November at a fantastic restaurant. Shortly after the birthday party, Mom was having trouble breathing again, which was caused by fluid in the sacs around her lungs. She was transported to a different local hospital this time. Not a single doctor in that hospital would perform the procedure to drain the fluid. At the family’s insistence, a doctor at another hospital said he would do it. She was transferred there, the fluid was drained, and she returned to the skilled nursing facility. A few months later, Mom had additional medical problems and went to the hospital. “This is it,” the family was told. “Make sure you have the funeral arrangements made.” For a full month, they prodded and poked, and came up with diagnosis after diagnosis. They kept telling us to let her go, but Mom kept on living. Finally (as happened to the woman whose letter I’ve shared), we were told we should provide her with “comfort care.” We were promised all sorts of things if we did so. She would be treated for her ailments, and not given any morphine or other drugs to knock her out. They made it sound wonderful and compassionate. We had a family physician meet with the hospital doctors, and he said, “If they do what they say they’re going to do, the comfort care looks like the best option.” So, we decided to give her comfort care. My wife’s sister went to the hospital and told the head nurse that the family had agreed on comfort care. “Fine,” said the nurse. “I’ll get the morphine drip started right away.” WHAT?! “What are you talking about?” asked my sister-in-law. The nurse replied, “In comfort care, we stop monitoring vital signs and give the patient morphine.” The family immediately canceled permission for comfort care and insisted that Mom be treated. Guess what? Within a week, the hospital decided Mom was well enough to return to the skilled nursing facility. The staff at the facility were overjoyed. They loved our mom and were so happy to have her back. They said they would take great care of her. And so they did. Mom lived at the facility happily for another six months. Every day, they got her out of bed and into her wheelchair. She participated in group events and really enjoyed the sing-alongs when they sang songs of her youth. On her last day, she was still participating in such events. Two family members had visited with her and even took her outside for a little while. She went to bed as usual, and God called her home while she was sleeping—a wonderful end to a wonderful life. But the entire family had to fight, tooth and nail, for over two years to stop those who would have denied her months of enjoyment, visits with family, and the death God had planned for her. Emanuel does not advocate euthanasia or suicide, but he does fight for the idea that life beyond 75 is not worth living. Your aunt has lived a good life; there’s no need to prolong it. You’re thinking of what you want, not what’s best for your aunt. She’s a religious woman, so it’s time to let her go to God. She’s a frail woman, so you don’t want someone pounding on her chest and breaking her ribs. Think of the medical staff: You’re going to force us to try and revive her when we know that, even if she survives, she’ll probably be a vegetable. Don’t put us through that. Even if we revive her, she’ll need to be hooked up to a ventilator. You’re then forcing the family to decide later—when your aunt is brain-dead—about when to disconnect the ventilator. The lesson in all of this is, unfortunately, don’t think of the medical community as a friend. There are some really good and caring medical personnel, but the community as a whole has lost its way. It simply has no understanding of God, or the meaning or merit of suffering. Prepare yourself and your family for a battle. Know the facts. Do research. Role-play. Know that if you are going to give your loved ones every moment God wants them to have, you’re going to have to fight for it. 1Associated Press, “Gov. Lamm asserts elderly, if very ill, have ‘duty to die,’” The New York Times, March 29,1984, NYTimes.com. 2Ezekiel J. Emanuel, “Why I Hope to Die at 75: An argument that society and families—and you—will be better off if nature takes its course swiftly and promptly,” The Atlantic, October 2014, TheAtlantic.com.